This is a more simplified version of the other giant latex design we offer. 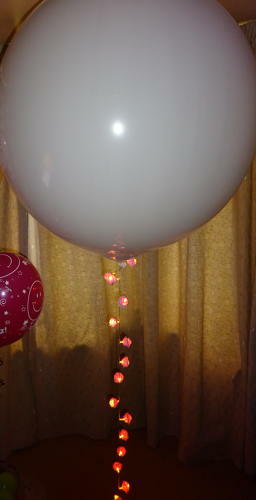 The plain balloons be done in any colour you want, specific occasions are also available in more limited colours. This version comes with just the balloon on a colour coordinated weight and ribbon. Optional extras are adding confetti or feathers to the inside for £5 per balloon, or add a string of lights or a feather boa, whatever you like. These look great in venues as they're so big and make a huge impact.